What happened to the Milky Way’s sister galaxy? 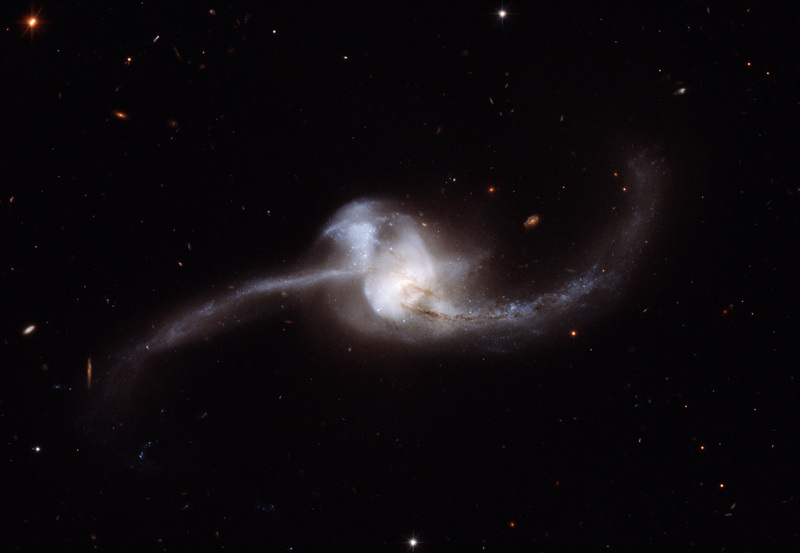 Cosmic cannibalism is incredibly common — we believe that all large galaxies grew through mergers with smaller galaxies. Our own Milky Way is guilty of eating its smaller siblings and will continue to do so, possibly consuming the Large and Small Magellanic Clouds at some point billions of years in the future. Our closest neighbor galaxy and the largest galaxy in the Local Group, Andromeda, will also eventually consume us! (Luckily, we’ll be long gone by the time that happens in about 4 billion years.) However, today’s paper isn’t about future mergers of galaxies in our Local Group. Instead, it discusses a significant past merger event between Andromeda (aka M31) and what used to be the third-largest galaxy in the Local Group, M32. M32 (see Figure 1) is a curious object — while it appears like an old, elliptical galaxy at first, it is one of the most compact galaxies we know of. It is much more compact than most other elliptical galaxies, which are thought to form through disruptive interactions and mergers with smaller galaxies. Hence, M32 has been creatively classified as a compact elliptical galaxy. Additionally, M32 has a lot of young stars (completely unexpected in old, elliptical galaxies), and it has a very high metallicity compared to its mass, suggesting that it was once much more massive than it is today. Previous studies attributed these observations of M32, the existence of a faint halo of stars around Andromeda, and the existence of a “Giant Stellar Stream” to multiple interactions between the two galaxies. However, several additional observations of the Andromeda-M32 system suggest a much more rapid and cataclysmic event. Faint stellar halos around large galaxies are generally indicative of interactions with and possible cannibalism of smaller galaxies, as is the existence of stellar streams. Andromeda’s halo and Giant Stellar Stream are quite peculiar, though. In particular, its halo is huge (~20 times more massive than the Milky Way’s), and both the halo and Giant Stellar Stream have high metallicities. How high? About as high as M32’s, in fact! Combine all of these observations with the evidence that Andromeda experienced a global burst of star formation about 2 billion years ago that produced one-fifth of all its stars and we’ve got the makings of a major galactic merger on our hands. Armed with the various observations of the Andromeda-M32 system, today’s authors simulated the merger of Andromeda and M32’s possible progenitor galaxy, M32p. Their simulations showed that Andromeda’s disruption of M32p sparked an increase in star formation in Andromeda shortly before M32p was completely devoured, leaving only current-day M32 behind. The authors’ simulations also showed that M32p was dismantled into a metal-rich halo and, in most cases, a metal-rich stellar stream. In other words, the authors’ simulations beautifully reproduced observations! Comparing their simulations to observations of the current-day system, the authors found that M32p must have been a whopping solar masses, making it the third-largest galaxy in the Local Group after Andromeda and the Milky Way (see Figure 2). Figure 2. M32p compared with the galaxies of the Local Group. M32p is represented here by M64, an analog in the local universe. Modified Figure 4 from the paper, credit: R. D’Souza. 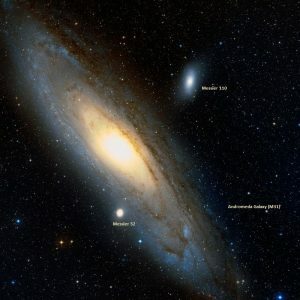 The authors of today’s paper combined observational data with computer simulations to determine that Andromeda likely underwent a major merger event with M32’s progenitor, M32p, around 2 billion years ago. All that’s left of that colossal collision is the dense galactic core now known as M32, a nearly-invisible halo of stars around Andromeda, and a feature known as the giant stellar stream that is thought to be stars thrown out during the merger. Prior to this study, astronomers believed that the presence of M32 and Andromeda’s giant stellar stream indicated multiple interactions between the two galaxies. However, today’s paper shows that a single, cataclysmic collision is sufficient to explain a multitude of observations — namely, the compactness of M32; the high fraction of young stars in M32; the observed burst of star formation in Andromeda around 2 billion years ago; and the similar compositions of M32, Andromeda’s stellar halo, and the Giant Stellar Stream. How did such a major merger leave Andromeda’s spiral structure relatively unscathed? The truth is that we don’t quite know. Perhaps M32p originally had a small galactic bulge that likely would have escaped coalescing with Andromeda’s core. More major galaxy merger simulations are needed to understand the conditions that dictate whether galaxy mergers result in mutual core coalescence, or not. Regardless, we now know that such coalescence is not a necessary end product of a major galaxy merger, which could have important implications for the Milky Way’s impending collision with Andromeda in just a short 4 billion years. Stay tuned! Black Holes and Dark Halos Growing Together The Fate of the Milky Way Measuring Galaxy Star Formation How habitable is your galaxy? Galactic archaeology is always a treat: Thanks for the article.